Rep. Paul Ryan exaggerates future growth of the federal debt in a chart contained in his newly released budget plan. Ryan, a Wisconsin Republican who chairs the House Budget Committee, displayed the chart below at a March 12 press conference on the House GOP budget for fiscal 2014. 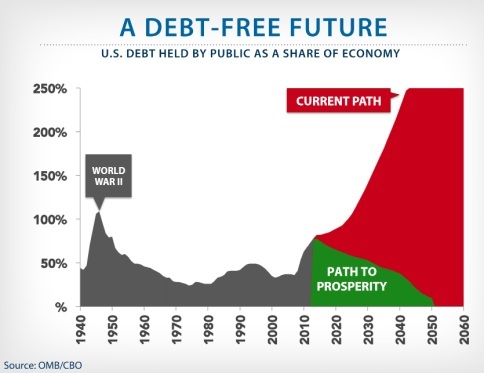 “This is the picture that should scare everybody,” he said, referring to the “current path” of U.S. debt held by the public as a share of the nation’s gross domestic product. House Budget Committee spokesman Conor Sweeney told us the chart relies on Office of Management and Budget’s historical budget tables for past years, and CBO projections for future years. Specifically, Sweeney said, the CBO projections come from a March 2012 report that CBO completed at Ryan’s request. That CBO report (see Table 1) projected that federal debt held by the public as a percentage of the economy would reach 96 percent in 2023, 128 percent in 2030 and 194 percent in 2040, and exceed 200 percent in 2050. It was 72.5 percent in fiscal 2012. Most important, these debt figures are projections calculated under the CBO’s “alternative fiscal scenario,” which assumes that Congress will continue certain policies that have been in place for years. This results in projections for higher spending, deficits and debt than CBO’s baseline, which is based on current law rather than current policies. CBO assumed that all of the Bush-era tax cuts would be extended. But Congress in January raised the tax rate for the top bracket and made other changes in the tax code, as part of the so-called fiscal cliff deal, which resulted in a total of about $737 billion in deficit reduction over 10 years. CBO also assumed the automatic spending reductions required by the Budget Control Act would not happen. But the cuts began to take effect March 1. If they remain in place, the cuts are projected to result in $1.2 trillion in deficit reduction over 10 years. That’s a total of nearly $2 trillion in deficit reduction over 10 years that’s not accounted for in CBO’s projections from a year ago. We don’t know to what extent the deficit-reduction deals will lower debt projections in the future years displayed in Ryan’s chart, except for fiscal year 2023. On page 34 of a report issued on Feb. 5, CBO notes that under its latest alternative fiscal scenario the debt held by the public would be 87 percent of GDP — which is lower than the 96 percent in CBO’s March 2012 report and the 97 percent in its June 2012 report. Ryan’s chart ignores $2 trillion in deficit reduction and compounds that exaggeration by projecting the inflated deficit figures out for many decades in the future. CBO, March 2012: Future budgetary outcomes will depend in large part on future policies — as evidenced by the fact that CBO’s two scenarios and the paths specified by Chairman Ryan and his staff, which use the same projections of future economic conditions but different assumptions about spending and tax policies, produce widely different paths for federal debt and other variables. Budgetary outcomes will depend on other factors as well, including changes in the economy, demographic trends, and international developments. Even small differences on an annual basis can have significant effects when cumulated over several decades. We don’t mean to minimize the unsustainable path of the federal debt. The debt held by the public is now approaching $12 trillion. It should “scare everybody,” as Ryan says, but the numbers he uses to make his point are outdated, inflated and highly uncertain.